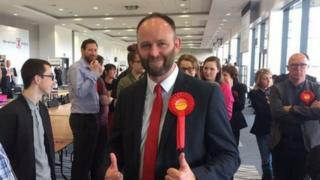 Labour candidate Paul Dennett has been elected as the new mayor for Salford. He won 28,332 votes and replaces Labour's Ian Stewart who announced last year he was standing down after becoming the city's first elected mayor in 2012. Mr Dennett criticised the Conservatives, saying he wanted a "better and fairer" city. Labour also retained its dominant share of Salford City Council by holding onto its 51 seats. The council's political makeup remained the same with eight seats for the Conservatives and one staying Independent. A council spokesperson said 50,256 votes were cast in the local elections after 30% of the electorate turned out. BBC News App users: tap here to see the results.